Tom Shippey, a fine academic and critic (I read his book on Tolkien years ago) reviews Jonathan Levi's new novel, Septimania, in last weekend's "Wall Street Journal." It sounds like the kind of ambitious novel I really enjoy, and I mean to hunt up a copy at some point and read it. But there's something else that I wanted to talk about for a moment. Shippey says there is a "hint of Harry Potter" in the start of the novel, and then describes the novel with sentences such as these: " As one of the characters says, 'No one sees Septimania for what it is.' It makes other conspiracy theories seem under-plotted." And also, "One can sum up by saying that the human characters are analogues of the mysteries, and vice versa. The characters’ fates remain mysterious, the mysteries’ solutions are in the hands of the characters." And also, "More than one reading will be needed to digest Mr. Levi’s comprehensive, many-branching vision. It adds new dimensions to the idea of the novel." Am I the only one who sees a "hint of Iluminatus" in these descriptions? (I notice there's an apple on the cover.) 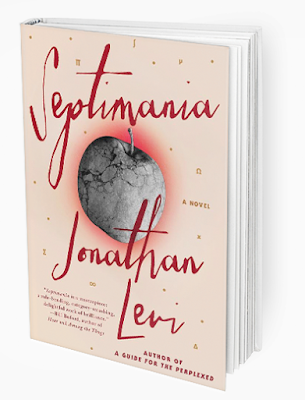 Have any of y'all read Septimania yet? UPDATE: John Merritt writes, "Septimania's conspiracy connection is not to the Illuminati, but to the Holy Blood, Holy Grail'conspiracy. As you can see from the Wikipedia article, Septimania was the center of the Cathar area, the Cathars being one of the major HBHG connections. The reference to Septimania is in the next to last chapter of HBHG, 'The Grail Dynasty'."